Are you looking for car rental services in Bucharest or Otopeni? FocusRent helps you enjoy the pleasure of driving a car with automatic gear that’s agile and energic and can hardly wait to take you safely to your destination, for only 45 euro/day. Hyundai Santa Fe, available through our car rental services is ready to offer you the best driving experience with its premium features: Air Conditioning, computer board, alarm system, fog projectors, electric windows, power door locks, electric mirrors, MP3/CD/Radio player, heated seats, servo-direction, 8 airbags, 5 doors, 7 passenger seats. The engine has 150 hp and has an average fuel consumption of 8 l/100 km. 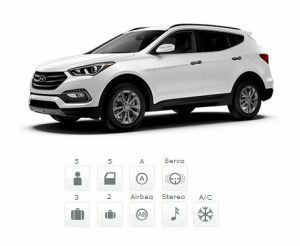 Hyundai Santa Fe is a grandiose and dynamic car with a modern design. It is the perfect car to rent for any situation, both for urban use and long journeys. Being a stable, silent and comfortable car, it’s definitely an option to be considered for vacation trips or business meetings. The large space for luggage and passengers make this car, which is available through our car rental services, the best option for long trips. In addition, because we care for our customers, we offer you a 10% discount, based on your membership card, as well as other benefits: a tank full of gas, no kilometers limit and all the car insurances and taxes included.